The year is 1984. Ducks run wild in a frantic battle for FAME and GLORY. Win over spectators by destroying your feathered friends with an IRRESPONSIBLE NUMBER OF WEAPONS. One shot and you’re ROASTED. This is DUCK GAME. Finally on Nintendo Switch with more LEVELS, more GUNS and more QUACKING. -Countless weapons and levels - including new levels FIRST on Nintendo Switch! 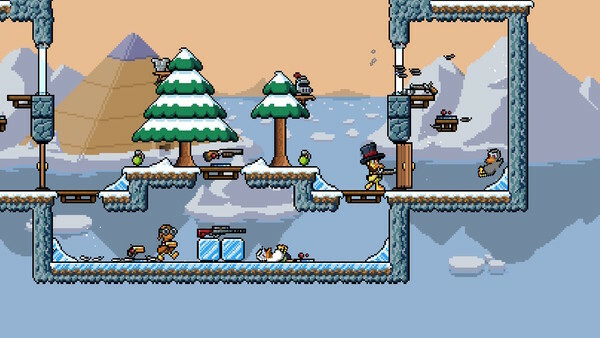 Duck Game hits Switch on May 2nd, 2019, and is priced at $13. The game is available to preload now. Finally. A port I can get behind. Is this the Ouya Duck Game? Yep. It was ported to PC a few years back and was one of the teases before Switch launched and I’ve been waiting since. Dedicated quack button is a godsend.